This Spinach Pesto is delicious and nutritious! It’s a nut-free pesto that makes a great sauce for baked fish or sauce for pasta. It’s a great way to get picky eaters to eat their spinach! I also tossed a little bit of this Spinach-Basil Pesto into the cooked basmati rice I served with the cod, and it was SO much better than just plain rice. You could also use this as a sandwich spread if you want. It would be delicious on a panini. Stir a little bit into a bowl of white bean soup for a huge boost of flavor. See, there so many options for using this nut-free pesto! 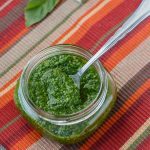 Not only does homemade pesto taste better, but you can avoid all those unhealthy ingredients that you find in the storebought ones. You get to control what goes in and avoid nasty ingredients like soybean oil. Even if it touts extra virgin olive oil on the label, it’s most likely mixed with another type of oil. And when a recipe is as easy as this nut-free Spinach-Basil Pesto, there’s no need to buy a jar. Traditionally, pesto is made using a mortar and pestle, but a food processor makes the process go a lot faster. In the bowl of a food processor, add the basil, spinach, Parmesan cheese, and garlic; season with salt. Pulse until finely chopped. With the machine running, add the olive oil in a steady stream through the feed tube, stopping to scrape down the sides as needed. Process until the mixture reaches your desired consistency of smoothness. 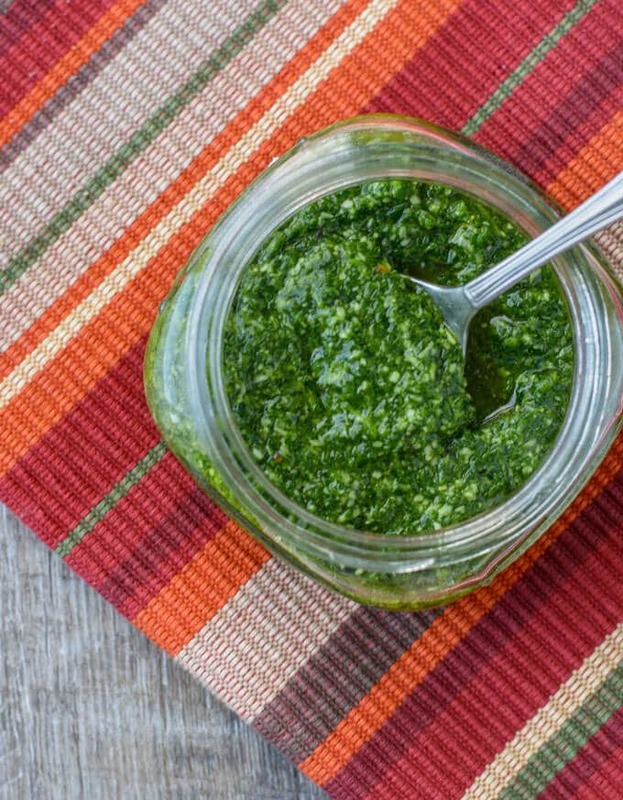 You can use this Spinach-Basil Pesto right away or refrigerate it and use within 5 days. Be sure to store it in an airtight container like a small mason jar. 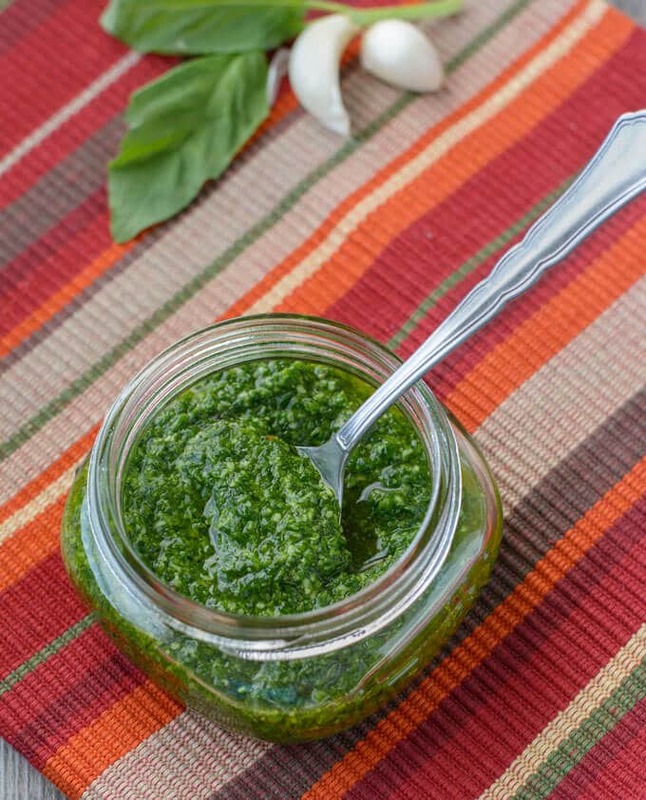 Save this Spinach-Basil Pesto Recipe to your “Sauces” Pinterest board! This Spinach-Basil Pesto is delicious tossed with pasta, but also makes a great topping for baked fish. Stir a little into Italian-style soups for a boost in flavor or use as a sandwich spread.